NES Dash Galaxy in the Alien Asylum (USA) in 06:37.33 by CtrlAltDestroy. 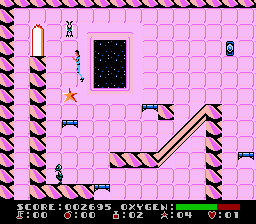 Dash Galaxy in the Alien Asylum was a game developed by Beam Software and published by Data East in 1990. Your objective is to guide the spaceman Dash Galaxy to the top of the alien rocket he has been imprisoned in, where an escape pod leads to his freedom. The author, CtrlAltDestroy, skips most of the puzzle rooms and gathers only the required items from the platforming stages in order to complete the game as fast as possible.